To identify a dejection, the genetic profile obtained must be identical to the dog’s genetic profile after comparison. Buccal cells are taken on the animal. This sample is sent to the laboratory for analysis of the genetic profile. The genetic profile is determined from the analysis of STRs located at 11 loci, the SRY region allows gender identification. Dog waste (8 days maximum) are collected by city services and placed in a suitable container. A form is available with the kit (location, date, …) is filled and sent to the laboratory. 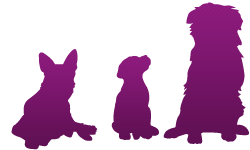 The laboratory analyzes the DNA extracted from cells coming from the dog waste, in order to establish a canine genetic profile. 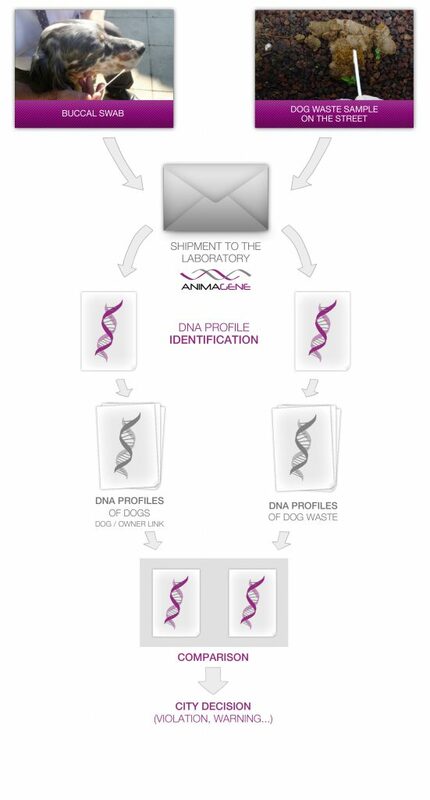 DNA obtained from dog waste is compared to the DNA of dogs identified beforehand. Results are sent to the city mayor and / or other service. The sampling kits will be sent to the specified service of the City. The contents of this kit will depend on the City’s wish regarding the dog waste sampling and conservation method before it gets picked up by a carrier. For example: Using a sterile glove, the agent will take the dog waste and place it in a plastic bag. It will be stored at -20°C if possible. The information form will be filled. The veterinarian rubs the dog’s gum and cheek during 20 seconds in order to collect cells from the surface of the mucous membranes (note that saliva does not contain cells therefore DNA). This buccal swab is quick, easy and painless: download the manual. This sample must be certified by the veterinarian: download the sample certificate. The sampling can also be done at the laboratory: view our access map. If the veterinarian can send buccal swab on the same day by mail, we recommend placing it in the refrigerator until shipment. The genetic analysis will only be performed if the sample certificate is complete and if the payment is done. A shipment system through a specialized carrier will be available with the city’s approval. Pricing will depend on the service provided.